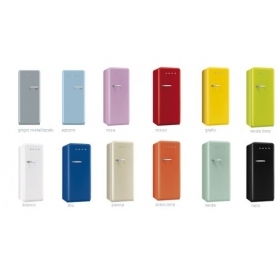 We Recommend Contacting the Shop When Choosing a Smeg Retro to Check Availability and Other Colour / Hinge Options. 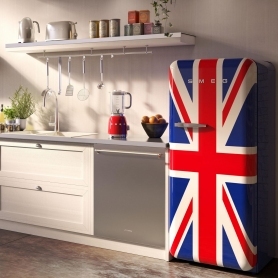 Finished in classic cream, the retro FAB28QP1 is a classic 50s style refrigerator packed with 21st century cooling technology. Rated a superior A++ for energy efficiency, this fridge also has a handy auto defrost function, offering consistently superior performance. The generous fridge space gives you 3 glass shelves, a fruit and vegetable drawer and a chrome wine rack. 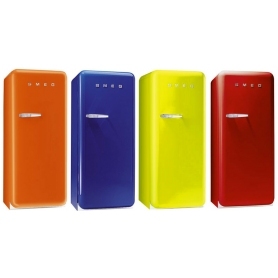 For extra versatility, there is also a 4 star ice box (26 litre capacity), giving you enough space to store some frozen goods. An adjustable thermostat helps you keep food and drink in optimum condition. Please note: this appliance has a right-hand hinge that cannot be reversed. A gap of 175mm must be left on the hinged side of the product to allow the door to open.